This has been one of my favorite breakfasts for the past year and I don’t see it changing anytime soon! So I know I’m like 2 years late on the overnight oats craze, but I’m also a decade late for blogging so bear with me, ok? If you’re anything like me and grew up on PB and banana sandwiches, you will LOVE this recipe. I try to use peanut or almond butter that includes only peanuts or almonds. No sugar or any added stuff! This breakfast always keeps me full until lunch which is helpful on busy workdays or weekend day trips. In the morning, top with rest of ingredients and enjoy cold! Combine ingredients and spread mixture onto a baking sheet. Bake at 350 for 15 minutes. Cool and store in pantry. Love, love love your photo! 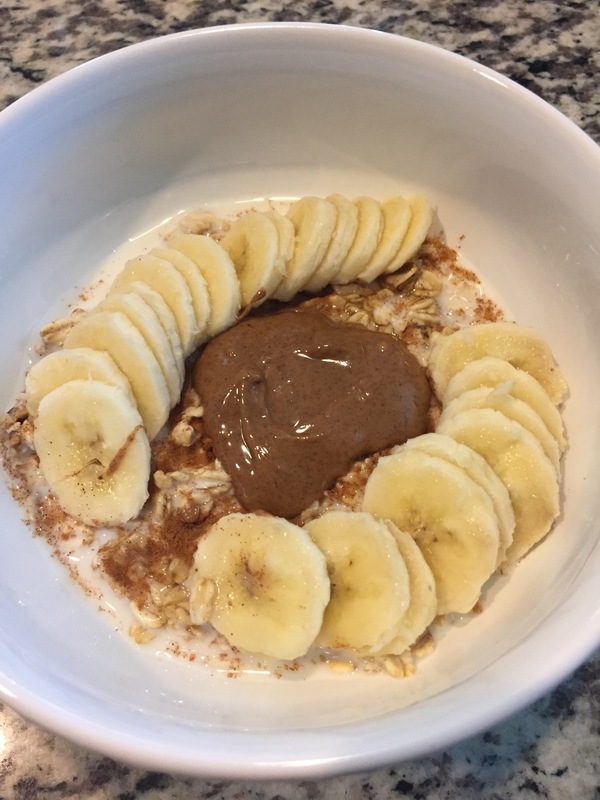 I adore overnight oats, and your giant blob of almond butter is making me drool. I also like to add granola and dried fruit (dates/prunes/raisins) on top for some extra pizzazz and great texture. Had this for breakfast this morning and it’s now my new favorite! Love it!! I use coconut milk. Very yum!